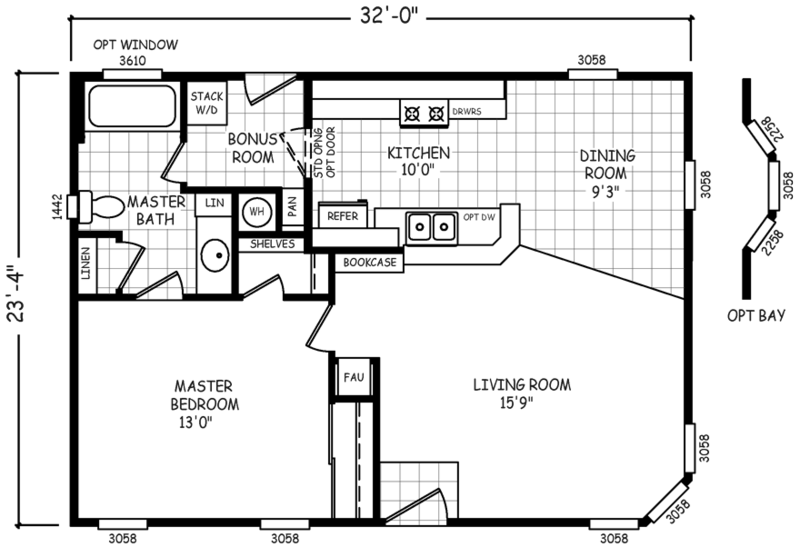 The Walden model has 1 Bed and 1 Bath. This 747 square foot Double Wide home is available for delivery in Arizona, California, Nevada, New Mexico, Colorado, Utah. Dependably constructed, the Walden has an incredible layout and a wealth of striking features. The living room and dining space combine to create a congenial area for families to gather and make fond memories while the cleverly-designed bonus room features a stack washer/dryer and pantry for additional storage. The very accommodating master suite is engineered for quietude and privacy, making it a pleasant place to unwind. If pictures are shown, they may depict upgrades and options that are not included within the base price of the home. Ask your housing consultant for details about the other great features that come standard on the Walden manufactured home.